Peanut Meringue and Chocolate Caramel Sauce - Let the Baking Begin! 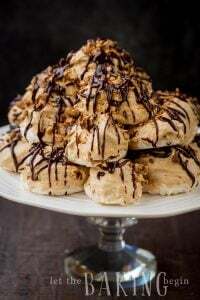 Peanut Meringues and Chocolate Sauce are perfect combination of light and nutty dessert that is delicious and perfect for someone who is looking for gluten free dessert options. They are also great as an addition to such cakes as Kiev, or Kolokola. 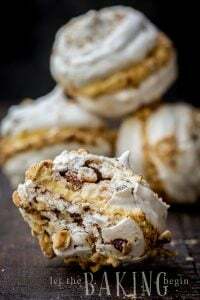 The peanut meringue is also great stacked with some Dulce de Leche Mousseline cream into a cake. If you want something even better, try to add a couple layers of sponge cake and you get Kiev cake. 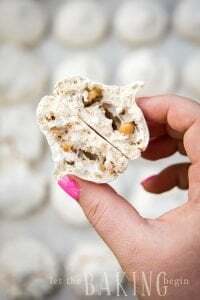 The meringue can be made with any kind of nut, but peanuts, hazelnuts or walnuts are my favorite! 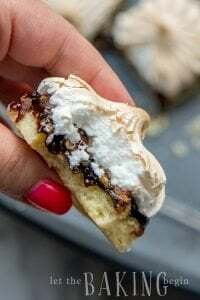 Go ahead and check out step by step photo recipe tutorial of the Basic Meringue to get an idea of what the process should look like. Salted Caramel Macarons – Amazing caramel macarons. 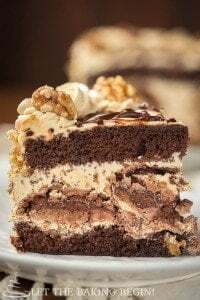 Hazelnut Meringue Cake – Simple meringue cake with hazelnuts, chocolate, and dulce de leche cream. Meringue Baskets – Meringues filled with chocolate and blackberries. Line a baking sheet with parchment paper or foil. Turn the oven to 300F. Using your mixer, start whipping the egg whites with a whisk on a medium speed with a pinch of salt (salt breaks down the “fibers” and helps the meringue whip up to it’s fullest volume). When the egg whites are white and frothy, add the cream of tartar and increase the speed to high. Once the egg whites reached soft peaks, slowly start adding the sugar, one tablespoon at a time. Continue whipping until pearl white in color and stiff peaks (about 10 minutes). Chop the peanuts (I bought them pre-toasted). The salt offsets the sweetness of the meringue. Throw the nuts into the whipped meringue and carefully, with minimal amount of folding incorporate them into meringue. Take a tablespoon of meringue and slide it off the spoon onto the lined baking sheet. Keep them about 1.5-2 inches apart as they do expand in the oven. Dry the meringue in the oven for 2 hours. Remove from the oven and let it cool on a cooling rack. To store: keep in a tightly close ziplock bag. Heat the heavy cream in a microwave, for 45-60 seconds until almost boiling. Chop the chocolate into small pieces and throw them into the hot cream. Add the condensed milk or dulce de leche. Let stand for 1-2 minutes and whisk together, until incorporated. Serve right away, or cover with food wrap and refrigerate. Microwave for 20 seconds and mix with a fork, to serve.